It was wonderful to see so many grandparents in attendance to celebrate Grandparents Day and the many gifts they have and all that they bring to our lives. We started the morning with a beautiful liturgy that brought a tear to many eyes! 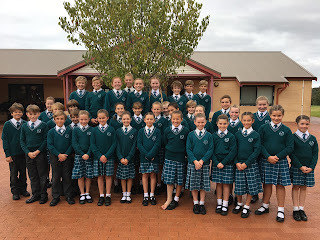 The Year 6 students willingly jumped in to help with the greeting of grandparents as they arrived, as well as serving morning tea, cleaning up and showing guests around. I was so very proud of them! A very big thank you to all grandparents that were able to attend, here are a few shots from the day. Please feel free to pass the link to the blog on. It was great to see all the grandparents willing to share the lessons they have learnt in their lifetime as well as what they love most about their grandchild! Answering some tough questions about their childhood! This is our last Monday of Term 2 of primary school for children... I spoke with the students this morning about this idea so that they could take a moment to let it all sink in! Grandparents Day - This is on tomorrow morning 27th June beginning with a liturgy at 9am in the hall. Morning tea will then be served and then grandparents are invited to come and spend time in the classroom. 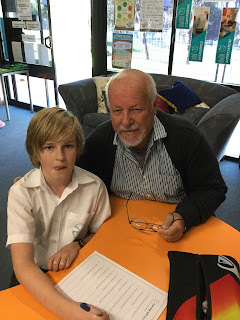 I have an Interview with my Grandparent activity for those with a grandparent that is able to make it which will give the students a little insight into what their grandparent was like when they were younger! Absentee Notes - Can you please make sure that all absentees have been resolved before the end of the term. I sent home notes to those with unresolved absences last week. If you can please provide a reason for the absence, sign and date the form and then return it to me by Wednesday 28th June. 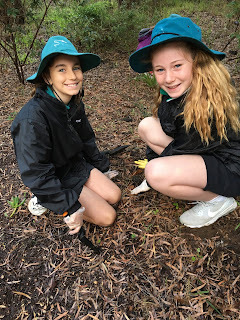 We were blessed with beautiful weather on our excursion yesterday, we did not get wet at all although apparently it rained cats and dogs here at school! The students were invited to assist with planting some tube stock to help re vegetate the area around Ngilgi Cave. This was a joint initiative that had come about through a successful grant application which was used to purchase the trees. These trees will support the flora and fauna of the area. The students planted over 200 trees in an hour...Rusty, Alan and Andre were very impressed with their efforts! During this time we also helped with pulling out some of the weeds that were starting to spring up! They were very diligent in their duties and were a wonderful advertisement for OLC. A very big thank you to Sasha Boundy, Michael Tutt and Caroline Jensen for coming along to help us, it was greatly appreciated! Mark Phillips from Hip Pocket has offered his services with the embroidery of the sashes. I have also given your child the form that will need to be filled in and returned with the sash and money by Thursday 20th July. If you do not wish to use Hip Pocket, that is absolutely fine. The end of term is soon upon us, hopefully the holidays are booked for somewhere warm and sunny?! As you may have heard, the 5/6 Senior Choir won their section of the Bunbury Eisteddfod on Friday afternoon. The sang beautifully and did OLC very proud, they have been working so hard and it was wonderful to see that hard work pay off...I was a little teary! There has been a change to the date of Confirmation. It will now be on Saturday 5th August beginning at 6pm. The Bishop got in touch with Mrs Meyer late last week to advise of the change of date. The child/parent workshop will be held on Thursday 20th July.Bishop Gerard will visit on Tuesday 1st August at 10am.We will have our Confirmation Retreat on Wednesday 2nd August - further details to follow. Welcome to week 8 of the term...we are getting close to the end of term but we are still working very hard! I am in the process finalising my reports this week. If your child is receiving an overall D grade in any area I will be in touch with you over the coming days to schedule an interview to discuss this with you in more detail. We will be beginning our Empowered by the Spirit - Confirmation Unit tomorrow. I will be setting a project for the students to work on to research the saint that they will be using as their inspiration during this important part of their faith journey. All students will be researching a saint and will be expected to hand in a report even if they are not receiving the sacrament. Students will receive an outline of their project tomorrow and we will go through it together. Reports will be due in Tuesday 18th July - Week 1 of Term 3. I hope that you enjoyed the glorious weather of the extra long weekend! Just a couple of reminders for the coming weeks. 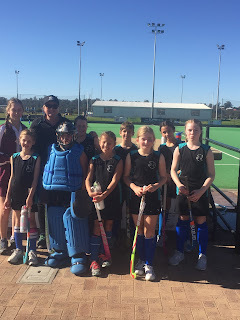 Winter Inter school Carnival - Thursday 8th June. Students will need to arrive at school by 8.15am ready to depart school by 8.30am. They will need to make sure that they have plenty of food and water for the day as well as their hat and sunscreen already applied. Please make sure that they have brought any required equipment with them such as sticks, shin pads, mouth guards etc. Eisteddfod - Hair Braiding - We are in need of hair braiders for the Eisteddfod on Friday 16th June. If you are available to come to school by 11am to help with braiding we would be most appreciative! Please let me know if you are able to help. We will be having our Parent Information Night on Thursday 20th July. This is in Week 1 of the term. Our Commitment Mass will be on Saturday 22nd July beginning at 6pm.